Corporate commuter shuttles in San Francisco are a great way to alleviate the number of cars on the road while freeing up employees to ride to work in peace and safety. They allow people who are living outside the city to drive to one central pickup location where it’s easy to park and then get the rest of the way to work on a comfortable, climate-controlled, wifi-equipped shuttle. This leaves employees rested and refreshed when they walk into work, rather than frustrated, stressed, and annoyed from their commute. In our last blog post, we talked about four tips that will boost your productivity while you ride the shuttle, ending with the tip that you should set realistic productivity goals. Read on for four more tips that will help you to make the most of your commute on our shuttle service. 5. Implement rewards for hitting your productivity goals. Your commute shouldn’t feel like a punishment or a drag. 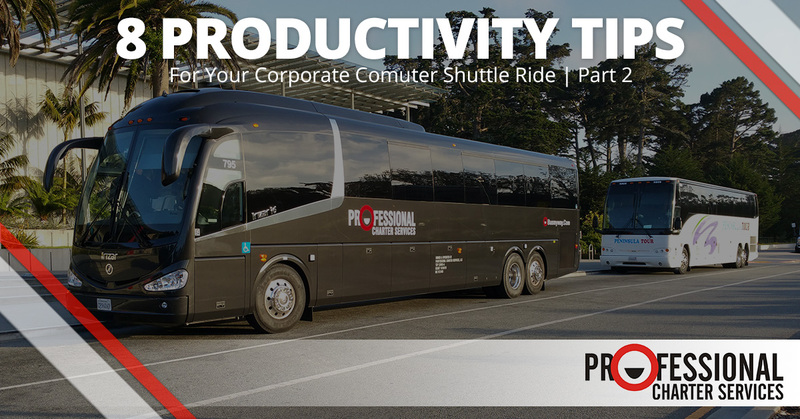 The point of having a corporate commuter shuttle is to take pressure off your shoulders and allow you to arrive at work rested and refreshed—and then decompress on the way home so that you get home rested and refreshed as well. If you are driving yourself too hard during your commute, you could be burning yourself out and missing out on the benefits that such a commute is supposed to bring. In your pursuit of productivity during your commute, there are two main human motivations that you’ll tap into: desire for gain, and fear of loss. Overall, desire for gain works much better as a sustainable method of motivating yourself, so institute rewards for yourself if you accomplish the goals that you set for yourself. These rewards should be big enough to motivate you without being too costly, such as a special coffee, a splurge on a small item you’ve been wanting, or an extra date night with your significant other. 6. Don’t underestimate the power of structure. Having a structured morning and evening commute can go a long way towards making sure that you can be the most productive. If your typical routine includes morning coffee, and then you miss the morning coffee one day, it’ll be harder for you to be productive, not so much because of the lack of coffee (although the caffeine deprivation can play into it, too), but because you broke away from your normal routine. Whether or not you’re a coffee drinker, having a morning routine (and protecting it) can be a huge part of sustainable productivity on your commute. Our brains crave predictability, routine, and structure, but at the same time, it can be the hardest thing in the world to impose that structure upon yourself until it becomes a reliable habit. Don’t give up on your pursuit of a structured routine as part of your productivity strategy. 7. Look into what turns on your brain’s executive function. Are you constantly plagued with the tendency to be distracted and unfocused, despite your best efforts and firmest resolve to be productive? It could be that your brain’s executive function is out of whack. The executive function is the part of your brain that decides, “I’m going to do this task now,” and if your executive function never kicks in, you’ll be meandering through the meadow of unproductivity, vaguely wondering what you’re supposed to be doing and why you aren’t doing it. Engaging the brain’s executive function seems to come more easily to some people than to others, but fortunately, there are easy ways to help to turn it on. Caffeine is one. If you’re constantly struggling to complete mundane, boring tasks, try drinking a cup of coffee right before you start, and experiment with whether that helps you to get your brain in gear. Not interested in setting yourself up for a caffeine addiction? Exercise is another alternative. Engage in the type of exercise that leaves you breathless and sweating just before attempting that certain kind of task that always eludes your focus, and see if that makes a difference in your ability to tackle it. In many cases, it will. 8. Don’t overlook the diet connection. The after-lunch food coma is a real thing, and certain foods can cause you to be more “comatose” than others. Empty carbs, wheat products, and sugary foods are some of the bigger culprits. If you’re eating a donut or a pop tart on your way out the door, try switching to a protein-based breakfast that’s still easy to grab and run, such as a couple of hard-boiled eggs. Does that make you more productive on your commute? Give it a week and then experiment by changing back to eating a donut. Do you suddenly find yourself in a fog again? Listen to your body and eliminate the foods that are unfriendly to a productive use of your time. There’s a good chance that the same foods that are causing inflammation, fatigue, and aching joints are also disrupting your brain’s ability to focus. You’ll feel better overall when you eat what will fuel your body with energy without the costly crash afterward. We hope you found these tips helpful. Have any more tips you’d like to share for how to maximize your productivity on your commute? Write to us and let us know what they are! In the meantime, count on Professional Charter Services for corporate commuter shuttle service in San Francisco. We look forward to serving you!